JET Exam: JET Exam is conducted by Joint Employment Test Exam every year. JET releases thousands of vacancies to recruit candidates. 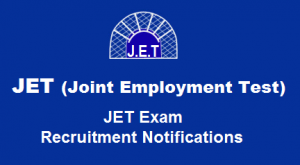 JET Exam releases IT Officer, Specialist Officer, Clerk Officer, stenographer and many more jobs. Get complete JET exams notifications and post details like qualification, pay scale, age limit, selection process, how to apply from here.